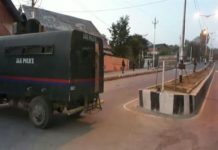 Srinagar: Security forces called off Cordon and Search Operation (CASO) launched on Monday morning in south Kashmir district of Pulwama, where clashes erupted and internet mobile service was suspended as a precautionary measure. Official sources said troops of Rashtriya Rifles (RR), CRPF and Special Operation Group (SOG) of Jammu and Kashmir police launched a joint CASO in village Drabgam, Pulwama, following a tip-off about the presence of militants. All the exit points were sealed and house-to-house searches launched, they said adding the operation was going on when the reports last came in. However, no militant was found and operation was called off, they said. Meanwhile, people, mostly youths, hit the streets in nearby villages trying to disrupt the operation. 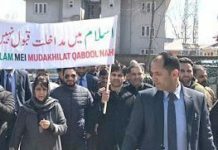 However, security forces deployed in the area burst teargas shells and resorted to lathicharge to prevent the stone pelting demonstrators to enter the cordoned off area. Several persons were injured in the clashes, sources said. 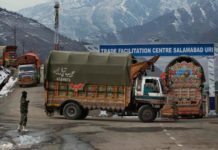 Locals alleged that one person was injured after security forces fired pellets, they said adding several others were injured in stone pelting.